My wife, Julie, and I went on the 4/21 8:30 am kayak tour through the mangrove canopy led by Ron Wofford. It was perhaps the best guided tour that we've taken. Ever. I am in the destination marketing business as the president of the Syracuse Convention and Visitors Bureau. I've been on guided tours around the world and your experience was top notch. We had a wonderful day made more special by the personal care provided by Ron to the two of us and the other couple on the journey. We probably spent close to four hours on the water. We saw wildlife, had a great time, and left with plenty of memories. And we needed it. A week ago, Julie crossed the finish line of the Boston Marathon five minutes before the first bomb went off. I was also there on the sidewalks with our two kids. Fortunately we weren't hurt, but all four of us had plenty of post traumatic stress. For Julie and me, the best way to shake off the stigma of "what if?" was to plunge ourselves into nature. Ron's tour was so completely therapeutic for us. We can't thank him enough. We learned about your company in your multi-page advertorial in Marco Review. 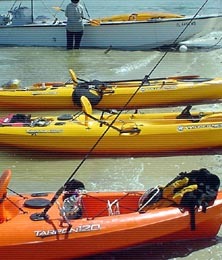 It was difficult to wade through the clutter of tour options (kayak and airboat). I think your advantage is the serenity you provide. The upclose experience. The ease of the meander. It is hard to communicate these traits in a travel magazine, but it is definitely your advantage. If we are ever back in the Marco Island/Naples area (especially with our kids) we'll definitely book with you again. And I have already been mentioning your incredible service to others, including Jack Wert with the Naples, Marco Island, Everglades Tourism Office. This was a last minute "trip" for us. On the last day of our trip we knew we just wanted to be on the water. Wow. What a good decision this was. We were afraid that at the last minute we would not be able to get reservations, but happily they were available. The trip was not what we expected, it turned out to be the highlight of our trip. Calm, serene, awesome and exciting all at the same time. The guide was quite knowledgeable and accomodating to all of our questions and very thoughtful regarding the wildlife and nature. THANK YOU, the trip was so very beautiful and we absolutely will be back whenever we come back to Florida. Everyone should put this one on their list. Loved our trip!!! Bruce was great and I would love to go back for other tours!!! Definitely a 5 star rating and a definite recommendation! This tour was the best I have ever had in over 40 years of vacationing. I have recommended the company to friends. The tour was so informative and professional but personal. It was truly a chance of a lifetime to have gone on this. Our boat assisted kayak tour was wonderful. It was much more than we expected. We have done similar excursions in Mexico and we saw far more wild life right here in our own backyard. I actually wrote a review on trip advisor. We will definitely be back to do other tours with your company. Thank you for the adventure. Our tour of the Everglades was the highlight of our vacation. This is a part of the country that we have never experienced before and getting out into the back country (which is what we do on all our "adventures") was great! Charles was our guide and he was extremely knowledgeable and easy to be with. We had a chance to see Roseate Spoonbills, which was amazing. I like to kayak and would have enjoyed to do more, but with the time we had, it was really not possible. We experienced a bit of everything and the time was well managed. If we ever get back to that part of Florida, I WILL take another tour and do more kayaking as the peace and quite of the mangrove forests was so refreshing. This was easily the highlight of our trip to Florida.